tallgrass prairie studio: Proud, Happy and Thrilled! 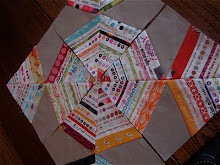 I'm so excited to tell you, if you don't already know, my Block Party virtual quilting bee is becoming a book! Congrats to Alissa and Kristen for leading this fabulous group and spearheading the idea! I'm thrilled to be a part of it. Head over to the Block Party blog for a giveaway and more exciting news. Proud, happy and thrilled. That's me! 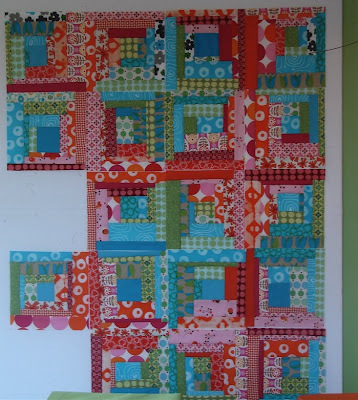 Here is the start of the quilt using the fabrics from the last post. It's inspired by Malka's Tuesday pillow that is on the front of 'Stitch' magazine. I like this layout...but I also played and made it into furrows and barnraising. It looks cool in those too, but I'm a LONG way from layout decisions. I have 25 blocks done...the quilt needs 110. One finish to put on the list...I think all of my friends have one of these now. They sure are fun to make! We've got lots of folks participating in the 'Joy in the New Year' challenge. Who knew so many of you had double digit lists of UFOs. This is going to be exciting! mmmm, that new quilt WIP is delicious Jacquie!!!! great log cabins!!!!! i love your last one!!! Absolutely, fabulous, thrilling, and long deserved. You deserve this honor in every way. 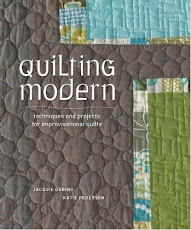 You're not only one of the most talented and artistic quilters online, you are one of the very nicest.It will be a phenomenal book! What sweet gifts to give your friends...you've a huge heart! The new quilt is fun and congratulations on the book! I am still loving that color combination. Love the fabrics on the new quilt you are working on. 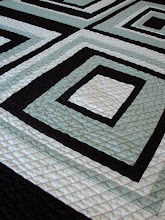 Your finished quilt is so fun!!! Have to make me one of those ;-))) Congratulations on the book!! Can't wait for it to be in print. So so exciting! I love the log cabin blocks you are making. The color combination is great. It makes me want to run upstairs and start working. I've been following along watching the block party and it really is exciting about the book. Think of how many more people will be inspired once they read the book. 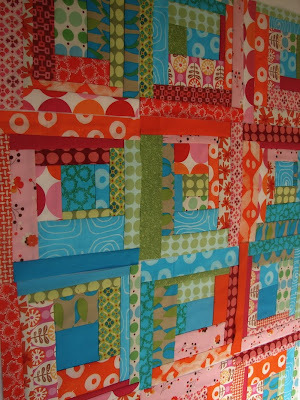 What a bright happy quilt- those fabrics together really make it joyful! I don't know if it's good or bad, but I only have two UFOs! How can that possibly be? My problem seems to be that I continue to buy supplies with the intention to create, but it usually takes a couple of weeks for me to actually get to the supplies! 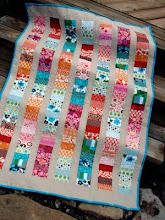 Absolutely stunning patchwork, fine colors and an incredibly beautiful miniquilt! I want to join the "Joy", but I don't have any UFOs! I only work on one quilt at a time, and I don't start anything new until it's finished! !~Hey!!!? I'm your friend and I don't have one of those!!! :) Love that one and LOVE the pinks oranges blues and greens log cabin. Sheer joy! Oh, Jacquie, I'm so excited for you! The book will be on my "must have" list! I love the little houses in the sun! love your little houses! so cute! You go girl! Exciting things happening! Love the new quilt. Very exciting to see such talent be complied in a book! Congratulations!!! Book: yay!! Quilt: DOUBLE yay! It's gonna be amazing!! I am proud happy and thrilled for you! I just went over and became a follower! Congrats!! Super jazzed about the book. I'll for sure be a supporter. Have to skip out of the UFO project, I have to move onto Christmas Presents. We start seeing for it at Thanksgiving. P.S. I moved my blog. I have a very similar top in the works! Looks great. 110??? The pictures must be deceiving -- the blocks look like they're fairly big. They're beautiful. LOVE that cute little house quilt too!!! I love the layout you have for the log cabins... I've been thinking about making one in that same layout for a while now. Your mini quilt is precious!!! Congrats on the book! 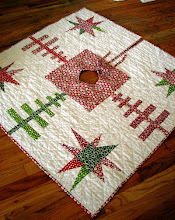 Love the new quilt and I love ♥ love the little house table topper. 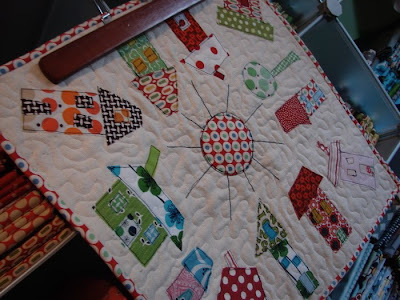 I don't know why I've never made a quilt with houses - I drool over other people's! Congratulations on the book. It's going to be terrific. I love the new quilt too! Love that log cabin! and the houses are so cute. I will need to scroll back and see if there are more... and I just spotted one of my current favorites from my stash! The orange/red/white/grey medalion print on the bottom right house! 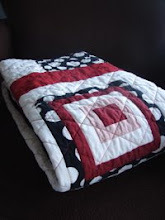 As your blog opened on my computer I gasped at the beauty of your quilt! It is fantastic!! Love, love, love the colors!! You are sooooo talented!! 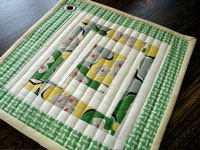 It's almost time to hang you darling house quilted hanging! It just seems like yesterday that I took it down. I'm thinking of having it put in a custom made shadow box this year and keep it up year round!! Your log cabin is looking wonderful. The finished runner is great - I don't have one, but I just might have to make one of those. 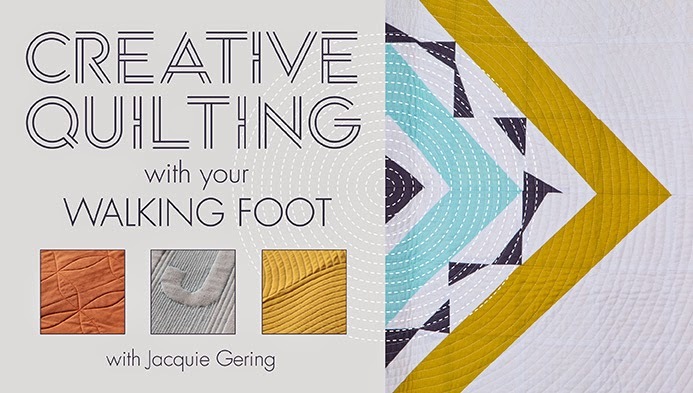 Congratulations Jacquie on the book, that is fabulous! And the quilt top is another dazzler! Congratulations!!! I am so happy for you. How exciting to have so many participants in your UFO challenge too. 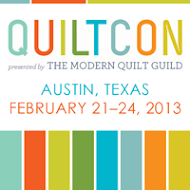 I don't know if its still possible to sign up, but I will be sewing along with you anyway. Hope to get some UFOs out of the way. i LOVE your log cabin blocks. the colors are so great!!! !!!!! How cool is that!!! Congrats, Jacquie!! !